Penguin Highway screenings at Japan Foundation Film Touring Programme. Screening at various locations across the UK in February/March 2019. We know a lot of you enjoy watching anime on the big screen, and hot on the heels of the exciting news yesterday that Mirai has been nominated for an Oscar, today we want to talk about another film in our catalogue – a film that will be receiving some limited screenings across the UK very soon as part of the annual Japan Foundation Film Touring Programme, that being Penguin Highway. Some of you may already be aware the film is screening as part of the touring programme thanks to the blog post we published recently putting a focus on various films in the lineup. In case you missed it, give that a read HERE. 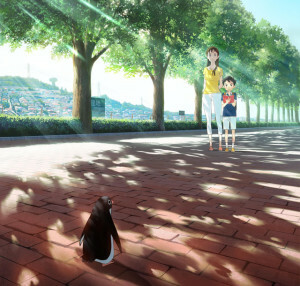 Penguin Highway received its UK Premiere last year and those who saw the film came out having thoroughly enjoyed themselves. The Telegraph’s review of the film gave it a 4★ rating describing it as “a heart-warming, hormonal mix of Twin Peaks and Studio Ghibli”. If you want to read more about the film, have a read of this piece by Jonathan Clements at our blog HERE. *Update: 4th Feb. 2019 – Above updated with booking links for Dundee & Colchester. *Update 22nd Feb. 2019 – Nottingham booking link added. If you’re able to get to one of these screenings we hope you enjoy yourselves! Make sure you visit the official website of the Japan Foundation Film Touring Programme for details on the complete lineup of films they’re screening. Will there be any screenings for Newcastle?